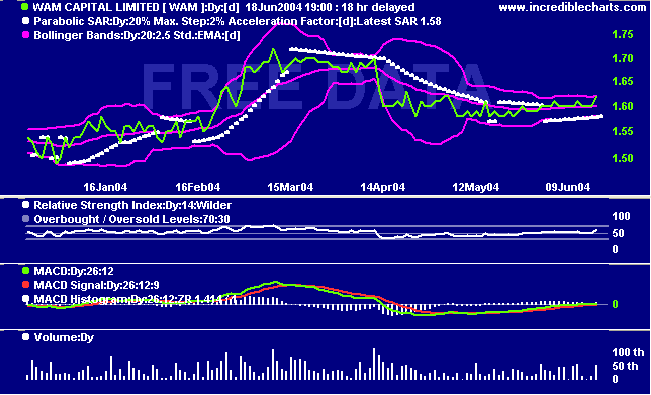 WAM Leaders Limited (ASX: WLE) initial public offering (IPO) is now open to investors. To invest in WAM Leaders please complete the online application and payment form. You can also contact your stockbroker or financial adviser. WAM Leaders will provide investors with access to the emerging leaders in the S&P/ASX 200 Index using a Research Driven and Market Driven investment processes. WAM Leaders is seeking to raise up to $209 million with the ability to accept an additional $165 million in oversubscriptions. Existing WAM Capital Limited, WAM Research Limited and WAM Active Limited shareholders are eligible to take part in the $99 million WAM priority allocation. Now $1.66, with options expiring on 31st July. Options are exercisable @ $1.60, and trade around 6c. If exercised before the dividend date in March/April, the new shares will attract a 6c div. Looks like no one wants to make money, seriously! check the price now! What do chartists call a 15% rise in two days - the result of a write up in the March 8 Sunday Herald by David Potts ? A Pott Belly or maybe a Pott Handle. Anyway, a quick rise from .735 to .84 is very nice in this market. Disclaimer : Believe nothing I write .